44/250 is part of the HW City series and the 2015 Treasure Hunt set. 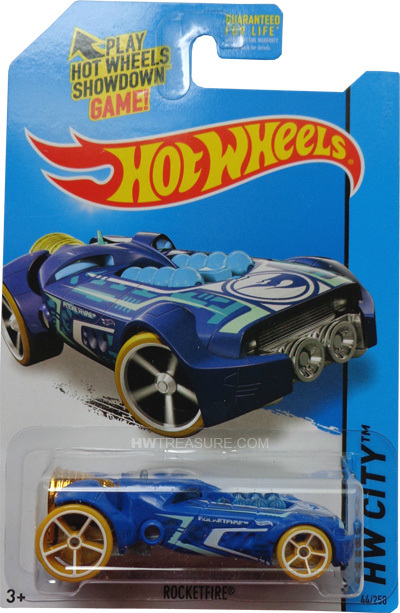 The metalflake blue car has white & light blue graphics with “RocketFire” and the Hot Wheels logo on the sides. The front features a large low production symbol in white. 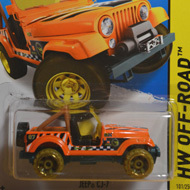 It has a light blue translucent interior, gold chrome engine, orange Open-Hole 5-spoke wheels with white spokes, and a chrome plastic Malaysia base. 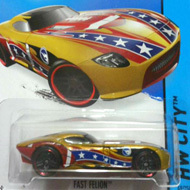 This vehicle can be found in mix “C” of 2015 Hot Wheels mainline cases. The RocketFire made its debut on the 2008 New Models series. The unique design is of a futuristic sports car with a rocket engine.